It was just a simple conversation. 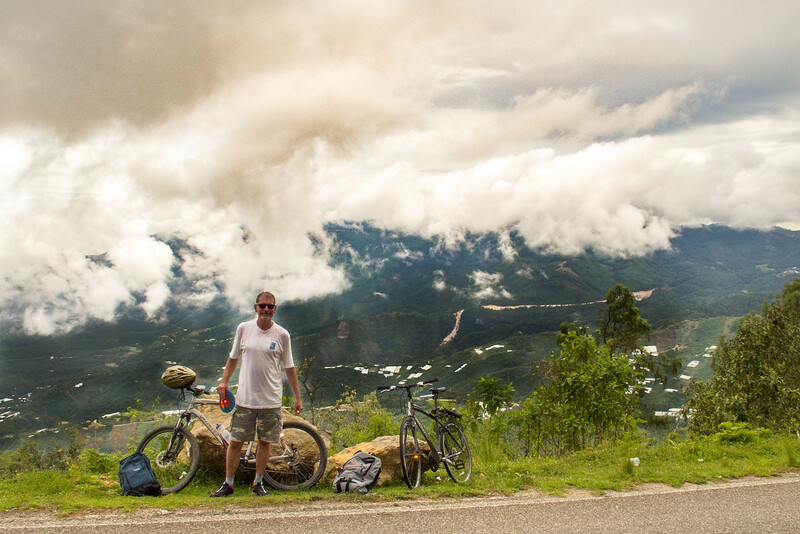 My friend Richard and I were having a beer on the Guadalupe Andador in San Cristobal de las Casas when he casually mentioned that a few weeks before he had rented a bicycle and rode from San Cristobal through the mountains to Chiapa de Corzo along old Mexico Highway 190. I have driven this route a number of times in a car but had never even considered doing it on a bicycle. He said it was a piece of cake, only about 10km uphill then nothing but coasting to the embarcadero in Chiapa de Corzo. He made it sound easy and I knew the route was spectacular. Even though I knew Richard has a penchant for understating hardship in my mind I was hooked. Trouble was, he was leaving the next week for Guatemala and unless I wanted to go alone I had to find a partner. I asked around trying to find someone to make the ride with me. The consensus was that the idea was crazy. The roads were too winding, there were no guardrails, there were no shoulders or bike lanes, and the traffic was too intense. Also, there was, what about the rainy season, what if the bike breaks, what if you run into banditos or Zapatistas, what if you can’t find a ride back, what if you get injured? Every reason that I heard to not do it only made me more determined to do it. Then I got an email from my friend Chris Larsen. He not only wanted to go, he was ready to go the following Sunday! Within 2 minutes I wrote him back and the trip was on. Sunday started partly sunny but you could see there were some showers in the mountains. I was a bit chilly dressed in shorts and t-shirt but I knew the weather in tropical Chiapa de Corzo would be at least 20 degrees warmer. We debated the dangers and possibilities of open travel on rain-slick roads in the mountains a bit but decided, “What is the worst that can happen?” and started out of town. Traffic was light and we made it to the outskirts of town quickly. San Cristobal sits in a kind of bowl between mountains in what is known as the Jovel Valley. To get away from town you must first make it over those mountains. I have used “granny gear” on my bike many times before but never really needed it until now. I thought I was in pretty good shape but this climb was tough. For kilometer, after kilometer, we climbed. The temperature was still coolish but I was working up a sweat. We stopped at a tienda to rest and for a few snacks then continued on. Soon it became apparent that Richard’s estimate of 10 kilometers uphill was a bit inaccurate. There were a few stretches where we could coast a but these were just fake outs and inevitably we would have to start climbing again. Then finally, just outside the village of Navenchauc, almost 20 kilometers from San Cristobal we crested a 2,400-meter high ridge and it was literally all downhill from there. Birds were singing, the smell of pine was in the air and the sun was occasionally peeking out from behind the clouds. We whizzed by brightly dressed Mayan women carrying huge loads of wood on their backs while their men bravely scouted out the clear and well-worn routes before them, burdened only with machetes. Grubby-faced children with beatific smiles would rush to the road to see the crazy gringos and shout out greetings. At times there were thousand foot drops on either side and rarely were there and guardrails but the overall condition of the road was good. We cruised in and out of clouds and sunshine. At times the only sound was the wind rushing by and knobby tire treads on the road. About halfway down we stopped at an amazing overlook and Chris took out one of his patented Pocket Discs and we tossed that around for a bit. The climate was warming and high mountain scents were giving way to more earthly aromas. The weather was beginning to look ominous but we never encountered more than light drizzle and we continued down. At times the downward slope was such that we were concerned about our brakes overheating as we approached hairpin turns. It was exhilarating! Less than 10 kilometers from our destination we came across the Waterfalls and Caves of the Chorreadero. In this amazing place, a river exits the mouth of a cave and immediately tumbles over a cliff forming a waterfall and some tranquil pools. Here there are palm trees and iguanas. The air is thick with humidity and the climate has changed from Alpine to tropical. Because of previous rains the water was a bit muddy but still beautiful. We climbed to the cave and went back as far we dared without lights. Due to insurance regulations and safety requirements, Chorreadero is the kind of place that could never exist in the USA. The walking surfaces were slick and one mistimed step could send you plunging onto the rocks below. From Chorreadero it was an easy coast to the embarcadero in Chiapa de Corzo. 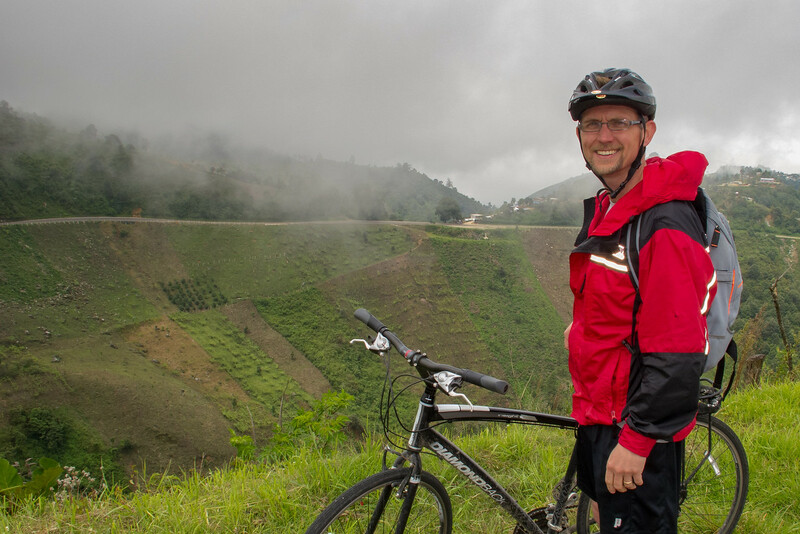 Over the course of the day, we had ridden over seventy kilometers and descended over 2,000 meters. There were some great adrenaline rushes but overall we never felt like we were in danger. One thing for sure though the feast we ordered and the restaurant overlooking Grijalva River near the entrance to Sumidero Canyon tasted delicious and we felt like we had earned it. Oh you are so much more hearty than me. I thought the bus to San Cristobal was enough of an adventure for me! When you ride in a car, Navenchauc is only 10 kms. from San Cris. Bikes always make it longer. 🙂 Thanks for the story of the trip. Sounds like you and Chris had a great time. Well, Google maps says 22.2km from Kukurutz to Navenchauc but to my legs it felt like even more. Next time I am bringing you guys. And maybe a support vehicle! I wouldn’t be able to walk for weeks if we biked that stretch — kudos to you for making the trip! It would be great to have the time to travel slowly, though, and check out the caves (something you wouldn’t be able to do if you took the bus). I would have gone with you! Come on up! I would so do it again.